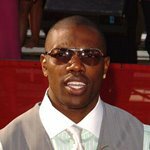 Born Terrell Eldorado Owens on December 7, 1973 in Alexander City, Alabama, the future star wide receiver, also known as T.O., was a four-time letterman in football at Benjamin Russell High School in his home town where he also played baseball and basketball. A 3rd round draft choice out of Tennessee-Chattanooga in 1996, he went on to complete 592 receptions for 8,572 yards and 81 touchdowns in his first 8 NFL seasons. His 20 catches vs. Chicago in 2000 set an all-time NFL record. One of the game's more entertaining players, (he practically invented the touchdown victory dance) critics sometimes accuse him of grandstanding, and Owens is certainly unpredictable. In one of his more famous trangressions, for example, Owens scored a touchdown against the Seattle Seahawks in 2002 and - with millions watching on national television - retrieved a Sharpie pen from his sock, signed the football, and handed it to his financial advisor sitting in the stands. 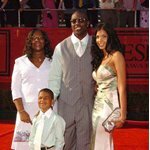 In 2004, Owens was embroiled in yet another controversy when he appeared in a Monday Night Football promo (video) in November 2004, opposite Desperate Housewives star Nicollette Sheridan, who seductively dropped her towel and jumped into the arms of the Philadelphia Eagles star. On the field, Owens had 77 receptions for 1,200 yards and a record 14 touchdowns before severely injuring his ankle late in the season. He missed the final two games and the first two playoff games before a return to the Super Bowl, in which he had nine receptions for 122 yards. 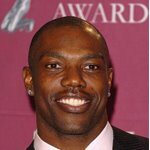 During the early 2005 season, Owens went out with a groin injury during practice as he renegotiated his contract in the second season of a seven-year deal with the Eagles worth $49 million.